Benjamin Franklin, Joseph Siffred Duplessis, 1785. National Portrait Gallery. A writer, civic leader, inventor, diplomat and top political thinker of his time, Benjamin Franklin was one of America’s founding fathers. And although most Americans know about his daredevil electrical experiment where he attached a metal key to a kite and flew it in a thunderstorm, there are many other reasons that Benjamin Franklin is known as one of the country’s most influential figures. Here are some fun facts about the man that helped shape our nation’s history. A common mistake made by many is the assumption that Benjamin Franklin was President of the United States. The fact is, unlike his contemporaries George Washington, Thomas Jefferson and John Adams, Franklin never held the office of the presidency. He was the governor of Pennsylvania, the first United States ambassador to France and Sweden and the first ever United States Postmaster General. Among his many other talents, Benjamin Franklin was a skilled chess player. He was inducted into the United States Chess Hall of Fame in 1999. He wrote a well-known essay, “The Morals of Chess” that detailed the rules of conduct for playing the game and was responsible for making chess a popular sport in America. As an apprentice in his brother’s print shop, Ben expressed his desire to write for the newspaper, the New England Courant. When his brother refused, Ben assumed a false identity of a widow named Silence Dogood and subsequently started writing letters in her name. Ms. Dogood’s popularity grew, which greatly angered Franklin’s brother once he discovered the prank. When Ms. Dogood began to receive marriage proposals from readers, Franklin thought it a good idea to put an end to it. While many people often associate Ben Franklin with Philadelphia, he was born in Boston, baptized in the Old South Meeting House and attended Boston Latin School. Today, an 8-foot statue in front of the Old City Hall, pays tribute to him and is also the first public statue of a person in the city. In keeping with his desire to help others, Franklin created the first volunteer fire department in America. This venture began when he wrote a series of articles in the Pennsylvania Gazette discussing his belief that there was a need for better fire prevention methods. The Union Fire Company was formed soon after in December of 1736 and became known as Benjamin Franklin’s Bucket Brigade. Including his risky experiment with the kite, Franklin did several others that were just as, if not more, dangerous. So much so that he nearly died twice. Once when he tried to use electric shock to cure a man of paralysis and another time when he tried to kill a turkey with electricity. While it is still unclear who actually invented the instrument, Ben Franklin is known for perfecting the glass harmonica. His design was so innovative and unique that Beethoven, Strauss and Mozart composed pieces for it. In addition to his passion for science and literature, Franklin spoke five languages including English, French, Latin, Italian and Spanish. He was self-taught and was always looking for ways to self-improve. Franklin is known for publishing Poor Richard’s Almanac, which included the advice, “Early to bed, early to rise makes a man healthy, wealthy and wise.” He is also known for the invention of bifocals, for organizing the first successful lending library, and for his ideas to increase the money supply as a way to stimulate the economy. In fact, the concepts described in his pamphlet “A Modest Enquiry into the Nature and Necessity of a Paper Currency” are still being used by the U.S. Federal Reserve and central banks around the world. Franklin is the only founding father that signed all four key documents that led to the formation of the United States. These include the Declaration of Independence, the Treaty of Alliance with France, the peace treaty with Great Britain in 1783 and the United States Constitution. 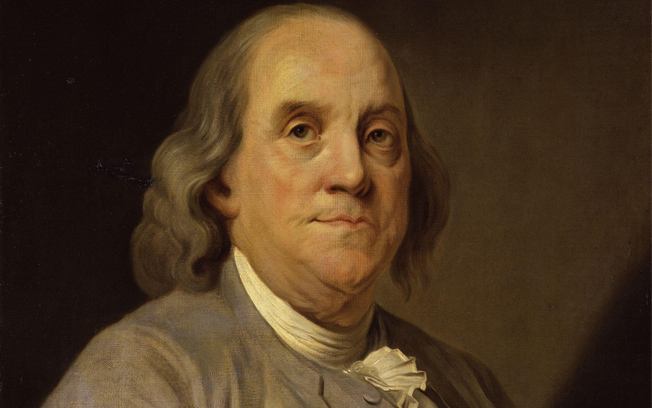 With all of his accomplishments, contributions and innovation, it is hard to imagine that Ben Franklin only had two years of formal schooling. His influence on America is still profoundly evident, and is evidenced in the fact that when he died in 1790, more than 20,000 people attended his funeral. While Franklin was fond of tea, he did not agree with the extreme measures taken during the Boston Tea Party. He was in London at the time and wrote a letter to several leaders in Boston, including Samuel Adams and John Hancock, explaining his feelings.